E-Stamp paper or electronic stamp paper is the result of electronic stamping which is an online application through which Stamp Duty can be securely paid to the Government. Most Govt. transactions require payment of non-judicial Stamp duty and doing it the conventional way would be time consuming. As all of us would already know, the most common use of stamp papers is for creating rental agreements. Law mandates that a certain payment be made to the Central/State Govt. each time specific kinds of transactions take place. Such payments are called Stamp duty. And examples of such transactions are buying and selling real estate, business agreements, leasing property, etc. However, the most common use of Stamp papers is for rental agreements. The payment for Stamp Duty is never made in cash. Instead, Stamp Papers worth the payment is purchased and the deed is printed/written on it. Stamp papers are proof that the required Stamp Duty has been paid to the Govt., much like receipts. The duty to be paid varies from state to state and if a state does not have its own Stamp Act, it will be overseen by the Indian Stamp Act. Adhesive stamps, paying at the registrar office etc. The above listed options may not be available in all states. While few states have all these methods, others have the provision for paying stamp duty by other methods. Among the methods listed here, e-Stamping is considered to be the most tech-savvy and convenient for the masses. Procuring a non-judicial Stamp Paper would require you to find a licensed Stamp vendor paying the duty for it. The contents of the deed and the details of executants are then written on to the document. The procedure to procure one can be time consuming. Locating and approaching a licensed Stamp vendor can take quite a bit of time. Not all Stamp vendors will have stock of Stamp papers of all denominations. Some keep Stamp papers of very low value alone. The above two points often leave people with no choice but to approach non-licensed Stamp vendors which puts them in risk of purchasing counterfeit Stamp papers. 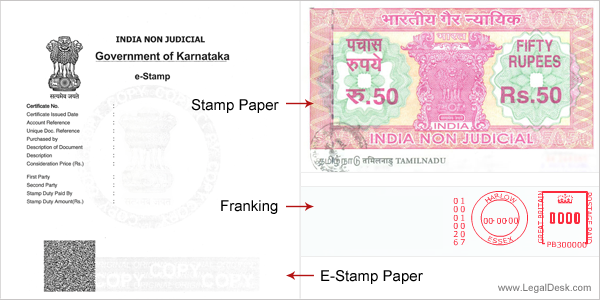 E-Stamping was the Indian Government’s solution to tackle counterfeit Stamp papers. In early 2000’s, the Indian Govt. appointed the Stock Holding Corporation of India Ltd (SHCIL) to implement and oversee e-Stamping operations. The SHCIL is also been given the duty of keeping record of all e-Stamp papers issued in the country. If you wish to use e-Stamp paper for your rental agreements, the first thing you will need to do is verify whether your state facilitates this. This should be simple, all you need to do is log on to the website of SHCIL and check if your state is included in the list. As of now, the states that allow e-Stamping include Assam, Gujarat, Himachal Pradesh, Karnataka, Maharashtra, Delhi-NCR, Tamil Nadu, Uttarakhand and Uttar Pradesh. To get a rental agreement printed on e-Stamp paper, you will first have to purchase an e-Stamp paper from allotted centres in your city (That’s right, you cannot purchase them online from SHCIL or their distributors!). Once you have the e-Stamp paper, write/print your prepared rental deed on it, following which, the executants, namely the tenant and the landlord, must place their signatures at designated places along with the signatures of two witnesses. This makes the contract, legally binding. 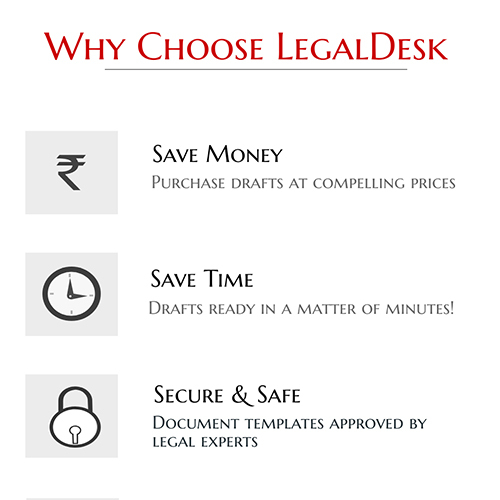 For those of you with neither the time nor the inclination to go out and find a lawyer to draft a solid rental agreement or find an e-Stamp paper issuing centre, LegalDesk offers a very attractive alternative. We have pre-drafted, lawyer verified online rental agreements which you can just customize to suit your needs. If you are busy to make an elaborated format, then try our quick rental agreement. And the best part is that we will print it on Stamp paper and mail it to an address of your choice! You don’t have to step out of your house or find a lawyer, just spare a few minutes and you’ll have a rental agreement at your doorstep! We also have online Will format and a host of other ready to use legal documents. Do take a look at them! And if you are looking to create a remtal agreement, click the button below and get started. There are 13 comments on "E-Stamp Paper For Rental Agreements". Hi Team…I’ve question regarding registered rental agreement. I received rental agreement with franking from flat owner. I need to present this as a proof of my present address proof at passport office. Is this franking rental agreement valid ? how to differential between franking and registered rental agreement ? can any one explain why we have to sign on all three sides of an agreement on a stamp paper. It looks absurd . All mentioned above is endorsed by undersigned by signing at bottom of a page. Hi, yes, you can type and print the contents of any document. But while buying estamp you need to provide party names, the purpose of buying estamp, etc. The eStamp will be printed along with all that information on it which cannot be edited later on. Please clarify — after getting an E-stamp paper, I can type/paste the contents on it — and print ?